Hi everyone! Lady Sovereign here with an update for you. Comet and I are getting along famously in our new home (check out the picture below of us napping). Our people are treating us well, with a modest helping of pellets in the morning, lots of exercise time through the day, tasty greens at night and unlimited hay. Though I have to say, sometimes the big person is slow on the hay refill. He also tries to pick me up, which I don't like. I thump to let him know, but this doesn't seem to dissuade him. I don't think he speaks bunny very well. Other than that, things are fabulous. You can find me napping behind the TV, hopping up on the couch, or frolicking around the living room. I just found my forever home and a hus-bun named Comet, who was adopted from SaveABunny in Oct, 2006! Hello. My name is Blossom, because I am delicate and beautiful just like an orange blossom. 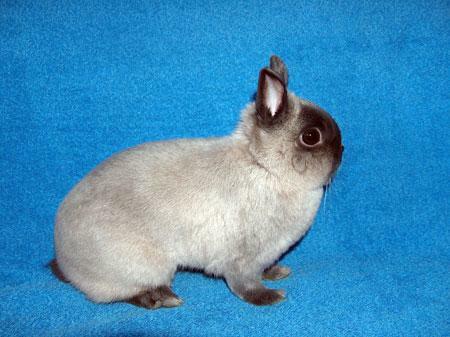 As you can see from my dainty ears and tiny face, I am a Netherland Dwarf rabbit and I weigh just over 2lbs. I'm already spayed and am about 2.5 years old. I was surrendered to the shelter by someone who said they became allergic to me. My small size makes me a bit on the nervous size, so I would really prefer to be with adults only or with older kids who know how to be gentle, yet firm, in handling me. I know it doesn't sound particularly lady-like, but I can be a bit "squirmy." I'm sure no one would want me to get accidentally hurt or frightened. I'm truly a pretty girl just waiting to share my love with the right person. I am very eager to be pampered and to find my forever home. Won't you please visit me soon?